POST SUMMARY | Some wildfires have turned into Firestorms burning up everything that stands in its path, as if it were a runaway freight train. Here is our recap for Tuesday, September 5, 2017. Active fire behavior with single-tree torching, backing and flanking. Estimated containment date is 10/1/2017. 500 acres. 0% contained. 110 structures threatened. Active fire behavior with backing, creeping and isolated torching. 3,709 acres. 78% contained. 0 structures/infrastructure/assets threatened. Estimated containment date is 9/20/2017. 58,794 acres. 65% contained. Estimated containment date is 10/15/2017. 1 home destroyed. 4 minor structures threatened. 2 minor structures destroyed. Recon flight over the Jack Creek Fire on 9/2/2017. Structure protection within the Alpine Lakes Wilderness will start on Wednesday. 2,154 acres. Estimated containment date is 11/1/2017. 23,106 acres. 0% contained. Estimated containment date is 10/15/2017. Fire burning on the Norse Peak Fire. 19,382 acres. 8% contained. Estimated containment date is 10/1/2017. 130 acres. 40% contained. Estimated containment is 10/1/2017. 2,382 acres. 1% contained. Estimated containment date 10/15/2017. Start 7/12/2017. Lightning caused. Fire fuels include: mixed conifer, brush and snags from previous fire scars (2002 Biscuit Fire and 1987 Silver Fire scars). Extreme fire behavior with group torching, spotting and short-crown runs. Eagle Fire. Credit: IAFF Local 1159. Resources include 1,599 personnel. 42 crews, 80 engines, 22 dozers, 21 water tenders and 7 helicopters. Incident Cooperators include Red Cross, BLM, USDA Forest Service, Brookings F&R, Coos FPA, Curry County, Harbor RFPD, Illinois Valley FD, Josephine County (JoCo), OR DOT, OR DOF and OR State Fire Marshal. 176,700 acres. 5% contained. 8,523 homes, 3,713 non-residential commercial and 50 other minor structures. 1 home and 8 minor structures damaged 6 homes, 20 minor structures destroyed. 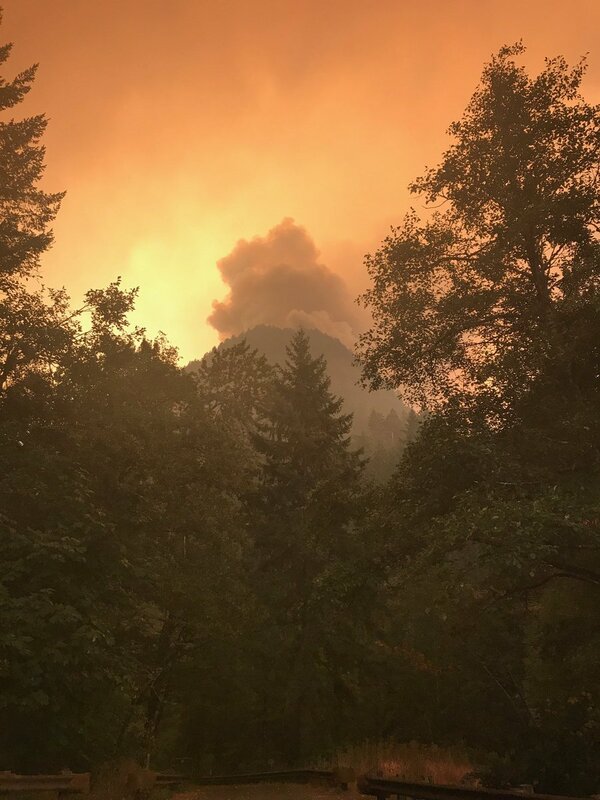 Eagle Creek Fire surrounds Munra Pt. in the Columbia River Gorge on 9/4/2017. Credit: Multnomah County Sheriff. Unified Command is made up of CFPA, OSFM and PNW Team 3. Become a Fire Smart Hero to yourself and your Family by becoming Firewise. Here is how you can start today by following these great recommendations, Courtesy of Forest Service NW. 283 homes and 15 mixed commercial/residential structures threatened. Extreme fire behavior with torching, wind-driven runs and long-range spotting. Fire has moved across the river and burning in both Oregon and Washington State. Fire crews were busy with structure protection and evacuations. 10,000 acres. 0% contained. Estimated containment is unknown. Multnomah County Sheriff Office states as of 1000 hours on Tuesday there are no new evacuations but the previous orders are still in effect. Level 3 Warrendale, Dodson, Larch Mountain, Latourell, Bridal Veil and East Corbett. Level 2 Corbett and Springdale. Evacuation Shelter is located at the Mt. Hood Community College at 3691 NE 17th Drive, Gresham, OR. 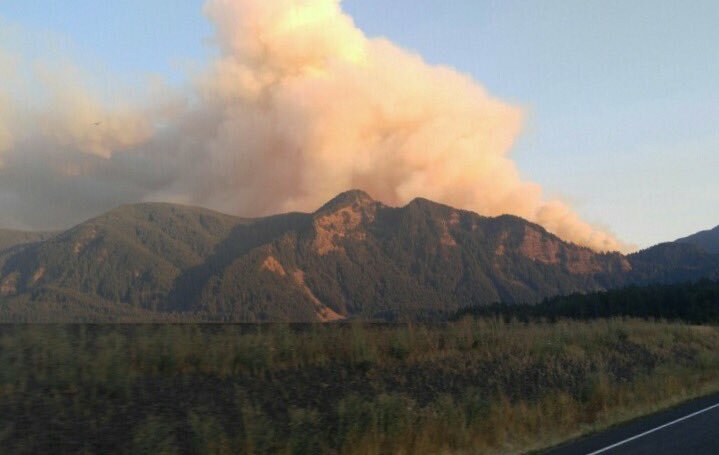 Social Media is reporting this fire located about 30-40 miles is East of Portland’s air is full of a brownish-grey color of smoke is hanging in the air for the several days and soot raining down below. Mop-up operations around Staley Fire. Fire behavior is moderate and backing. 2,234 acres. 76% contained. 217 personnel. Very little smoldering and creeping observed on Monday. Crews are continuing with mop-up operations. 782 acres. 51% contained. Snow shelter covered with fire-resistant wrapping. Broken Lookout Fire. Priority fire due to Hwy 62 and Union Creek. To use air resources to stop fire spread and to strengthen containment lines, as well as structure protection. Blanket Fire. 2nd priority due to Hwys 230 & 138 and the entrance to Crater Lake National Park. Burning within the Blanket Creek drainage on the Rogue River – Siskiyou NF. Crater Lake National Park. A lightning strike caused the fire to ignite on 7/26/2017. Spruce Lake Fire. 3rd priority due to Hwy 62 and Wood River Valley. Another lightning strike caused this fire on 7/29/2017, burning on the West side of the Crater Lake National Park. NW IMT Team 7 took over management on 8/24/2017. Pup Fire. 4th priority due to Hwy 62. To provide structure protection for Hershberger Lookout and nearby telecommunications site. Incident Cooperators include OR DOF, OR Military Department and Warm Springs FD. Fire remains to be active with short-crown runs, group torching and short-range spotting. 42,120 acres. 18% contained. Potato Hill fire on 8/31/2017. Crews continue to mop up within the fire perimeter and secure containment lines as the fire continues to smolder in heavy fire fuels such as heavy logging slash and timber (litter & understory). Smoke due to heavily impact Hwy 20 night and early morning. 12 miles West of Riddle and 8 miles SE of Camas Valley. Reported 8/27/2017 around 1530 hours. Cause is unknown. 1,099 personnel. Incident Cooperators include: DFPA, Coos FPA, OR DOF andTenmile RFD, along with multiple industrial landowners, logging companies and contract firefighting crews. Unified Command consists of the NW IMT Team #12, Willamette NF and the OR DOF. Fire behavior is active with spotting, uphill runs, and group torching. Monday’s activities included addressing and use fire suppression tactics to put out spot fires and securing lines again. 8,536 acres, 48% contained. Estimated containment date is 10/30/2017. Fire fuels include timber, tall grass and brush. Oak Knob, Brookentooth, Devil, Rattlesnake, Happy Dog Fires. 31,568 acres. 24% contained. Estimated containment is 9/30/2017.